The new Nigerian National Identity Cards launched Thursday by President Goodluck Jonathan, with branded logo of the American firm, MasterCard, have sparked outrage across the country amid fears of serious security and economic breach, with many Nigerians calling for an immediate stoppage of the deal. Nigerians expressed shock and fury Thursday at how the Nigerian Government, through the National Identity Management Commission, NIMC, would surrender a symbol of national sovereignty and pride to a foreign commercial organisation by not only sharing the biometrics of 170 million Nigerian to the firm but by also allowing the firm to boldly engrave its insignia on the IDs. Many Nigerians raised the alarm over the implications of the agreement in an age that has seen intense data surveillance by the National Security Agency of the United States of America, Mastercard’s home country. One commentator said allowing MasterCard’s emblem on the Nigerian National ID Card could only compare to the trans-Atlantic slave trade abolished in the nineteenth century. “The new ID card with a MasterCard logo does not represent an identity of a Nigerian. It simply represents a stamped ownership of a Nigerian by an American company,” said Shehu Sani of the Civil Rights Congress. 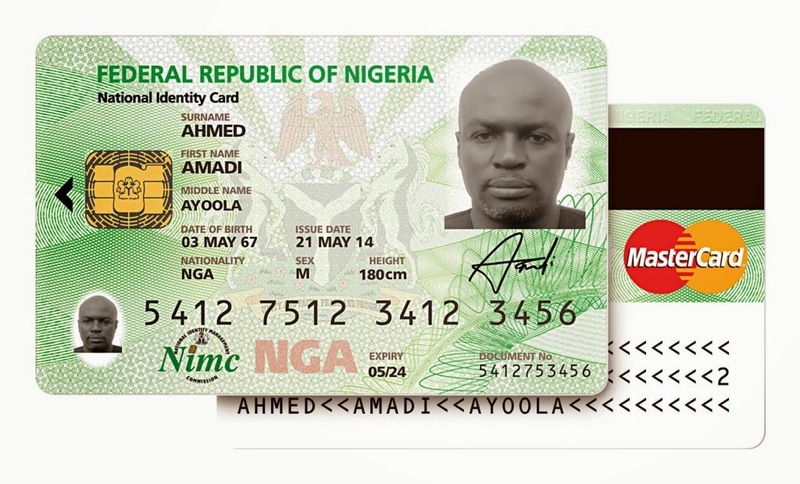 “It is reminiscent of the logo pasted on the bodies of African slaves transported across the Atlantic.” At the launching Thursday, the Nigerian Identity Management Commission said the cards, designed to also allow handlers effect payments and other financial transactions, will be issued to 13 million Nigerians. At the completion of the pilot phase of the program, 100 million cards would have been issued, the commission said, describing the move as the “broadest financial inclusion program in Africa”. The cards will be issued to Nigerians, 16 years and older, and are expected to serve as voting cards in the 2019 elections. President Jonathan, who flagged off the rollout, praised the outcome of a partnership between NIMC, MasterCard and Access Bank. “The card is not only a means of certifying your identity, but also a personal database repository and payment card, all in your pocket,” Mr. Jonathan said. Under the partnership, the NIMC is the project leader, MasterCard provides payments technology, while Unified Payment Services Limited is payments processor. Cryptovision is the Public Key Infrastructure and Trust Services Provider, and the pilot issuing bank is Access Bank Plc. The Identity Management Commission said it was working with other government agencies to harmonize all identity databases including the Driver’s License, Voter Registration, Health Insurance, Tax, SIM and the National Pension Commission into a single, shared services platform. For a National ID card project jinxed for decades due to corruption and mismanagement, Nigerians welcomed what seemed like a breakthrough this time, several years after the first attempt at a national Identity Card project ended in fiasco. But the optimism waned after it became clear Thursday the new ID cards, a key instrument recognised by the federal constitution, will not only bear the Coat of Arms and the Nigerian colours of green white green, but also the logo of MasterCard, a profit-driven private entity. “Nigeria’s colours and coat of arms is what should be there. It is not an opportunity for advert for promoting companies,” said Eze Onyekpere, Lead Director Centre for Social Justice. “As far as we are concerned it cannot stand. It is not worth it if that’s what they have done.” Beyond national pride, many Nigerians spoke of the dire economic and security implications for Nigeria. “Clearly, there are National Security implication,” said Nasir El-Rufai, a former Minister of the Federal Capital Territory. “All these data go to the American payment platform.” Mr. El-Rufai recalled that Malaysia was the first country to implement a general multipurpose ID card and that the country did so with its own resources and technology to protect its citizens. Economically, analysts say, the deal also hands over all adult Nigerians as direct and compulsory customers of MasterCard. The US-based firm appeared so elated at the outcome of the contract that by Thursday, it hired a media consultant, African Media Agency, to publicise the landmark deal all over the world. MasterCard could not be reached immediately for comments. Details of the partnership between the NIMC and MasterCard were unclear as of Friday. A former senior government official, well briefed about the process, said the Nigerian government may have adopted the Public Private Partnership model for the project, with MasterCard underwriting part of the cost of the deal. Still, the former official, who asked not to be named, said it was unbelievable that Nigeria could not insist on fully funding such a project at any cost, considering its strategic importance to its sovereignty. The Nigerian Identity Management Commission, NIMC, refused to comment on the concerns. When contacted by PREMIUM TIMES late Thursday, a spokesperson dismissed the concern raised by our reporter. “What is wrong with that (displaying MasterCard’s logo on the IDs)?” asked Ben Alofoje, the Assistant Director/Head Research and Strategy, who is the designated media person for the project.